Rescue ship Aquarius, which has picked up almost 3,000 migrants from the Mediterranean this year, will carry out rescue missions without waiting for orders from coastguards and will not return people to Libya, its search and rescue head said. "When we see there is a vessel in distress, with a high likelihood of people dying, we will go and rescue them immediately as per international maritime law," Nick Romaniuk told Reuters on board the Aquarius. Over the last year coordination centres asking rescue vessels to go on standby or wait for clarification on certain things had added to the danger of people needing to be rescued, which is why they would no longer wait, he added. The 77-metre vessel, operated by Franco-German charity SOS Mediterranee, set sail from Marseille this week on its tenth mission of the year. The ship will be patrolling between 25-30 miles from the Libyan coast, west of Tripoli, an area that is outside Libya's territorial waters but inside the Libyan search and rescue region. International law states the country responsible for operations in an area has primary responsibility for disembarking rescue ships. Romaniuk said that while Aquarius would continue to abide by international maritime law, it would not be taking people back to Libya because it was not a safe place, putting it at odds with the wishes of the new Italian government. "Libya is still not recognized as a port of safety, so (we)will not be taking people back there, because... a rescue cannot terminate in a place which is not deemed a port of safety," he said. "It has to continue for the time being to be European ports. But again, it's not our decision to make, maritime authorities, they make that decision, but our red line will be not taking people back to Libya," he said. In the past the Aquarius has waited for orders from the responsible authorities before moving ahead to rescue migrants aiming to reach Italy from Libya. But Italy has toughened its stance since the new government, a coalition including the anti-immigrant League party, took office earlier this year. Interior minister Matteo Salvini, leader of the League, has spearheaded a policy to shut ports to charity ships that pick up migrants from overcrowded smugglers' boats. He now wants as many as possible to be picked up by Libyan coastguards and returned. In June, the Aquarius picked up 629 migrants off the coast of Libya, planning to take them to the nearest European port - the usual practice with such rescue missions. But the Italian government asked the ship to go to Malta rather than Italy, triggering a standoff that drew in the European Union and France. 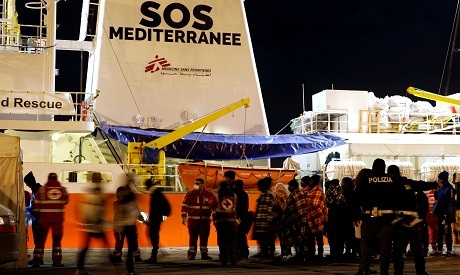 Salvini has accused SOS Mediterranee and other charities of acting like a Mediterranean "taxi service" for the migrants. The Aquarius is one of a number of NGO-supported ships that have carried out rescue operations in the southern Mediterranean, alongside the Italian navy and EU-led missions. A rescue boat operated by the Spanish charity Proactiva Open Arms this week rescued 87 migrants in the southern Mediterranean in international waters. More than 10,000 migrants have drowned in the region since 2014, according to the International Organization for Migration.